Former Fox4 reporter Rebecca Aguilar's $2 million wrongful termination civil suit against her ex-employers at last went to trial in downtown Dallas Monday morning, with a 12-member jury selected before attorneys squared off in oft-pointed opening statements. 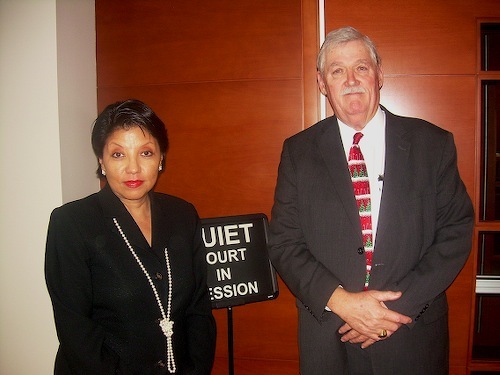 Michael Shaunessy, lead attorney for NW Communications of Texas, Inc. and Fox Television Stations, Inc., sought to highlight what he termed the "two sides of Rebecca Aguilar." Her acknowledged abilities as a dogged, resourceful reporter clashed with an abrasive workplace attitude, he contended. "Rebecca treated every question by a supervisor as an attack," Shaunessy said. Biennial evaluations in 2000 and 2002 praised her as one of Fox4's strongest reporters, but termed her a poor employee otherwise, he said, showing jurors documents to that effect. Aguilar's head attorney, Bill Trantham, described his client as an "intense" reporter who "had ambitions to be the best of the best." "Up until about 2004, it was one accolade after another," he said. But Aguilar also "had been conscious for a long time that minorities had been shortchanged at KDFW (Fox4)," Trantham alleged. Aguilar's suspension came on the day after her controversial interview with an elderly West Dallas salvage business owner who had shot and killed two alleged burglars within three weeks time. The chain of events attracted national attention and heated debate on whether she had "ambushed" him (outside a sporting goods store where he had just bought another shotgun) or was just aggressively pursuing an interview that rival stations also coveted. Fox attorneys showed jurors raw unedited footage of Aguilar's parking lot confrontation with the then 70-year-old James Walton. He repeatedly balked at being on camera but also was conversational and seemed to be in no great hurry to leave while she continued talking to him. Technical difficulties prevented the footage from being shown in its entirety Monday afternoon. Attorneys for both sides said they expected the trial to last from four to six days. The pace was sluggish at first, with 160th district court judge Jim Jordan patiently sifting through what documents would be admissible in trial. Fox4 general manager Kathy Saunders and news director Maria Barrs both were periodically in attendance on Day One, with Saunders the first witness called by Aguilar's attorneys late Monday afternoon. She was questioned by Aguilar's second attorney, Chris Raesz. Asked to cite current "aggressive" Fox4 reporters with a drive similar to Aguilar's, Saunders named veteran investigator Becky Oliver, Shaun Rabb, Brandon Todd and Emily Lopez. "Those are the ones that come to mind," said Saunders, who has been Fox4's general manager since March 1997. But have any reporters won as many awards as Aguilar, named the National Association of Hispanic Journalists' Broadcast Journalist of the Year less than two weeks before she was suspended? "I would really think Becky Oliver had as many if not more" awards than Aguilar, Saunders replied. Oliver's name also came up in a document introduced by the defense team. In a January 2002 email to Barrs, Aguilar said she had no "passion" for conducting a reporters' workshop after Oliver had received Emmy recognition and she had been passed over. Defense attorney Shaunessy said it was another example of Aguilar's belligerent workplace attitude and disinclination to be a team player. She improved for a brief time under the tutelage of Barrs, but "we couldn't keep Rebecca Aguilar turned around," Shaunessy told jurors. He also claimed that she increasingly "cut corners" in search of "sensational" scoops. "The Walton story was the story that broke the camel's back . . . In the end, the bad outweighed the good," Shaunessy said at the end of an opening statement that ran at least twice as long as Trantham's. Shaunessy also spent far more time quizzing prospective jurors from an initial pool of 50. He seemed to both score and slip during the process. Everyone agreed, for instance, that those who are wrongly terminated still should make an effort to find another job. The not so veiled implication was that Aguilar hasn't held a full-time job since her suspension. Her husband still works for Fox4 news, in an off-camera capacity. The prospective jurors also agreed that it's fair to evaluate employees not only on their performance strengths but on their ability to get along with co-workers. But Shaunessy seemingly stepped into a minefield after asking the jury pool if they perceived Fox to be a typically powerful corporation with big advantages in any lawsuit. A significant numbers of hands went up in the affirmative. "I already have a judgment in my head," an African-American woman who wasn't chosen said. "It's five of you against one of her," she added, referring to the larger defense team for Fox even though Aguilar was seated beside her two attorneys. "It's just that corporate usually wins out," another prospective juror said as Aguilar fought back tears. "Is there anybody who wants to serve on this jury?" Shaunessy then asked. Only a few hands went up. One potential juror, pro golfer Justin Leonard, eventually was spared spending the week in a courtroom after saying he had a commitment to play in a tournament this week. Attorneys finally decided on a jury of nine white women, two white men and an African-American man. The trial resumes Tuesday, with several Fox4 reporters on the witness list, in addition to their bosses, Saunders and Barrs. Aguilar herself also is scheduled to testify at some point.